Greetings! Meet Regal Kitty, and, if you’ve met her before, then how about a peek into her design? 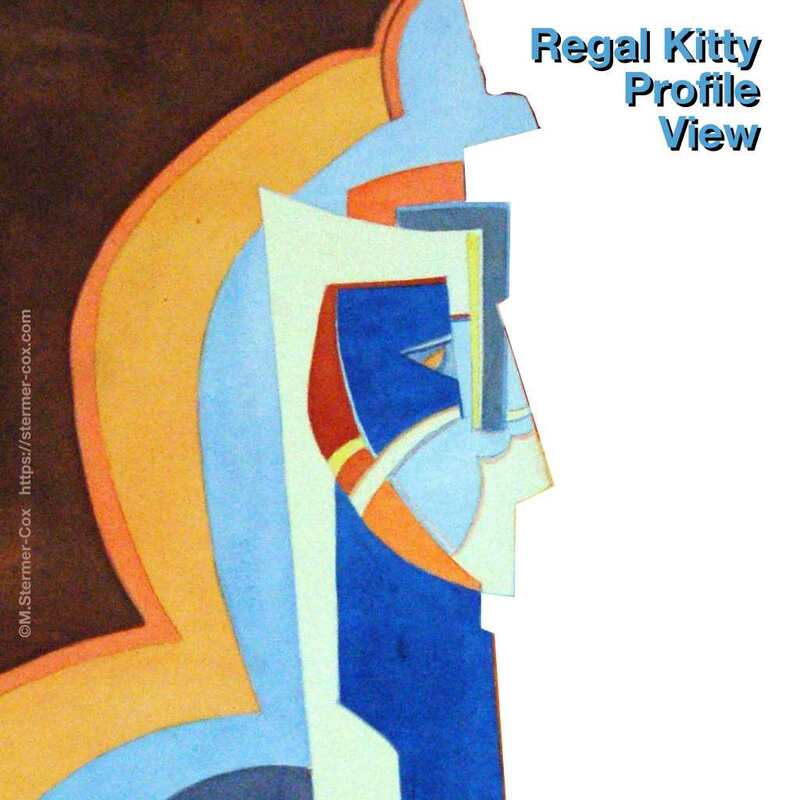 The purpose of this article is to give you some insight into how I designed my painting Regal Kitty. More specifically, I would like to share with you three composition features that I purposely included in this painting. Fractured planes – the “Cubist Style” approach. Shape and line, where shape dominates but line adds character. Value and color scheme; value is important; color is managed. To set the stage, I’ll start with a bit of history. Regal Kitty was painted in 2009. I had been reading books on Cubism because I wanted to understand what this important art movement was all about. 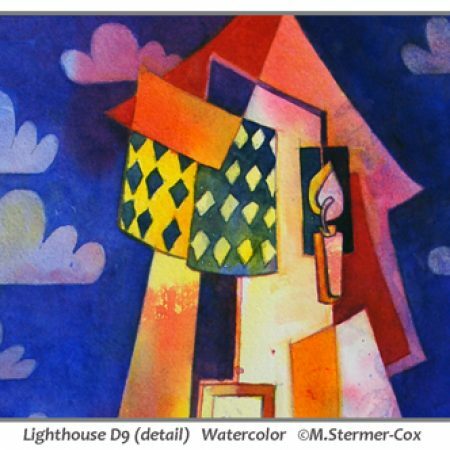 How did they create “Cubist” paintings? I liked the shapes and lines of Cubism and wondered how they did it. In order to understand the movement, I thought I’d try my hand at designing my own Cubist style painting, though how does one start? 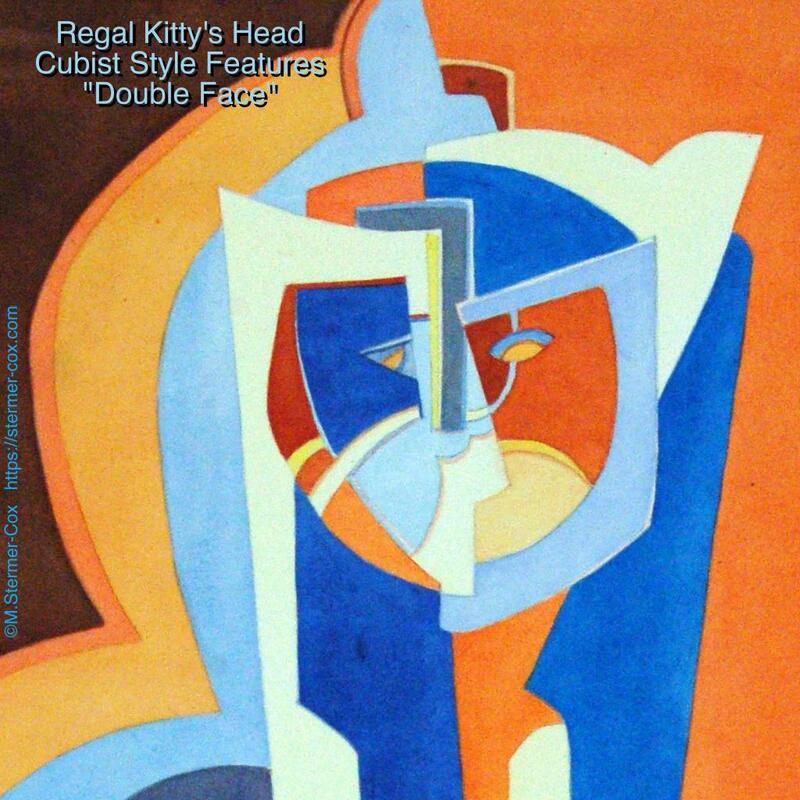 To me, one of the signature moves of the Cubist era, that is to say the design that stands out was the double face. I find it intriguing to see both views together – front and sideways. But, how to combine both sides? Well, the best solution I could come up with is just to start. I worked with several drawings, trying to marry side and front view faces. It was a struggle; its not as easy as one might think coming up with a coherent design! Then, I ran into drawings and etchings by Cubist sculpture Henri Laurens. Wow! I get it (sort of); I had a way in! 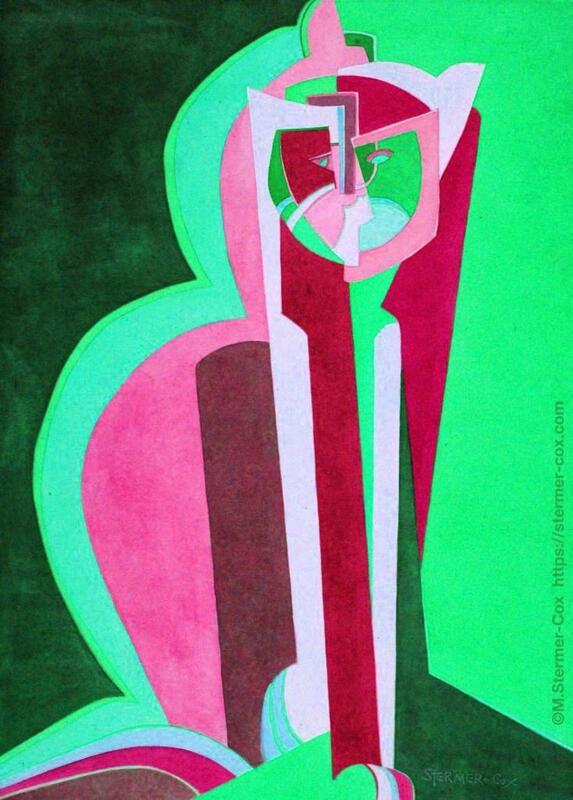 You see the Cubists were thinking sculptural, or three dimensional and drawing two dimensional. 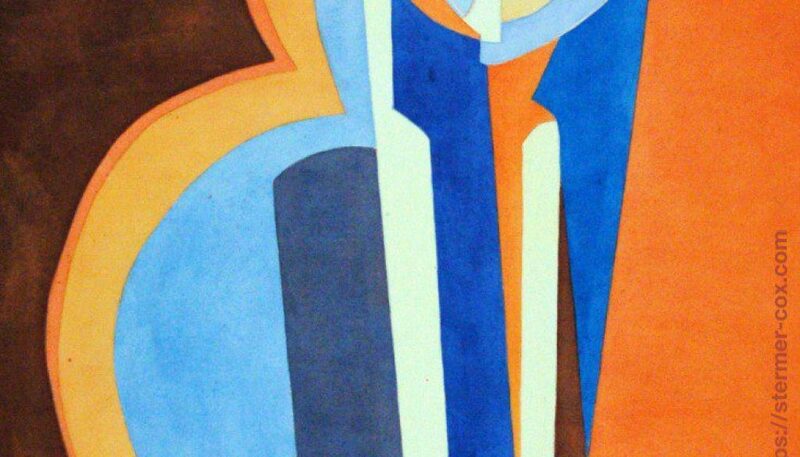 There is a sculptural side to Cubist paintings. 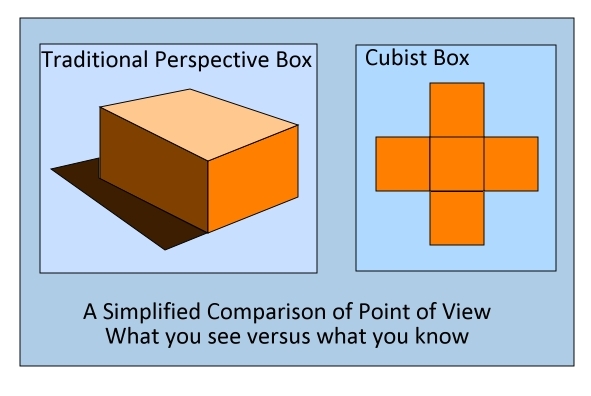 That is why a flattened box, where you see all six sides at the same time, is a good starting point for understanding Cubism. Back to Regal Kitty. All these Cubist ideas were pinging around my brain. After seeing photos of Henri Laurens sculpture plus his drawings, I plunged in again and tried to draw a cat. If you look closely at the head, you will see I did indeed include a sideways (profile) view and a forward view of the cat’s head. All the other shapes allude to the different planes of the cat-figure flattened. Think sculptural and statuesque. I was pleased with the resulting cat design. Design Elements: Line And Shape. 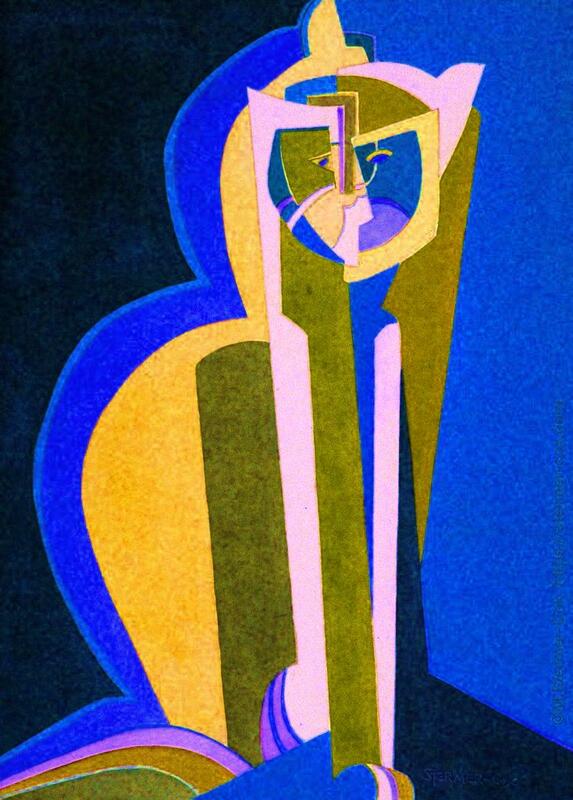 Another device I noticed while looking at paintings done in the Cubist era was the interplay of line and shape. 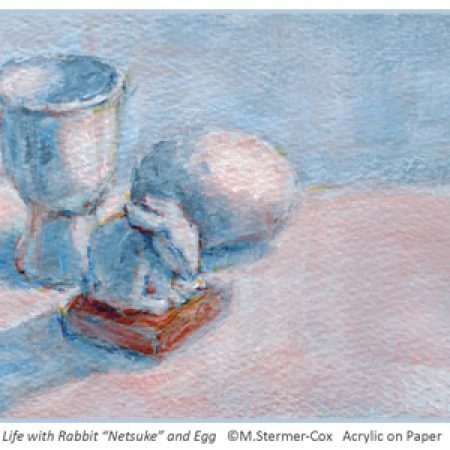 Some of the objects in a still life, for example, might just be outlined. Other objects will be filled with color, value or texture to create a shape. I liked the marriage of both line and shape. But, as I learned while studying design, its best for either line or shape to be dominant. When you have both in equal number, its confusing. So with the design of Regal Kitty, I focused on shape as dominant over line. However, around the face, I used line to add character, (see the detail of the head above). Naturally, you might say, the face is the center of interest. That is where you want something a bit special to catch the viewer’s eye. More Design Elements: Value and Color. Both of the design elements “value and color” play an important part in this design. I would consider this a value painting first. Value, the relative light and dark of each shape, is what gives the design its power. Plus, it is the relative light and dark of adjoining shapes that helps to express the feeling of a statuesque cat. 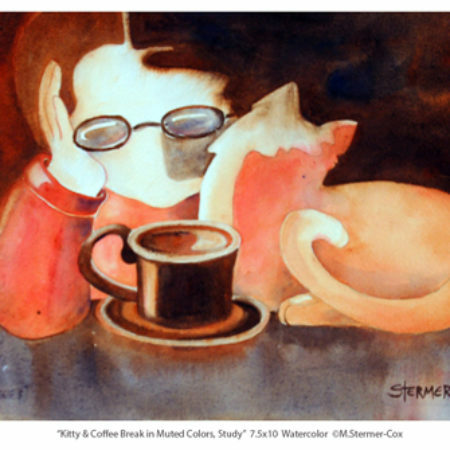 When I was developing my color scheme, I considered the relative value and intensity of the colors in relationship to each other. So, a dark blue, for example, might read as a plane or side that is turning away from you, the viewer. On the other side, a warm orange or yellow feels like it is advancing toward you. I chose a complimentary blue and orange color scheme for a couple of reasons. Foremost, a complimentary color scheme makes it easier to manage color. Its like composing with a simplified color chord rather than an entire kaleidoscope of colors. Granted, there are times when lots of different colors are just what’s needed, but that’s not what I wanted to do here. Another reason for the blue and orange is that I simply like the scheme. It speaks softly but with some dignity and serenity. You guessed it, the blue dignity is linked to the “regal” word in the title. Sometimes its easiest just to see what a different color scheme will do. I manipulated the image of Regal Kitty to give you a violet and yellow scheme as well as a red and green version to see. It changes the meaning somewhat, don’t you think? You might like a different color better; its all a matter of taste and what “speaks” to you. Looking Again And Sharing Secrets. 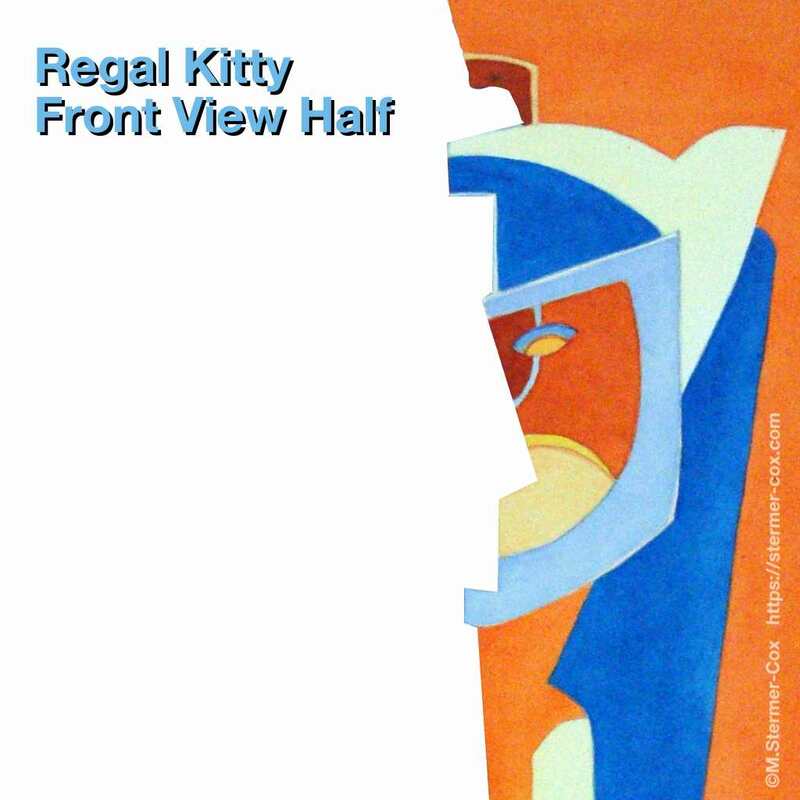 So, now that we have talked and looked at Regal Kitty for several paragraphs, how do you see her now? Do you see more? Has her meaning changed? I like sharing with you my secret “double faced” cat; its like a little joke just between you and me. My Regal Kitty is trying to be dignified and regal, but she’s really looking at you, or is she? Perhaps she’s contemplating the meaning of life and the greater universe. Or, maybe, she’s thinking its time to go take a nap. Thank you for sharing your time with me and Regal Kitty!